Chained within the mythical realms of primeval black/death metal, so graciously unveiled in the early 80's by hallowed cults such as Venom, Hellhammer, Celtic Frost, Possessed, Messiah, Destruction, Necrovore, Bathory, Treblinka, Slaughter (CAN) and Necrophagia, Pentacle's sepul­chral tribute, to this unforgotten legacy, started back in winter '89/'90 when Mike (guitar), Wannes (bass/vocals) and Marc (drums) joined forces...Entangled in the growing urge to inspire their own roaring metal quest, Pentacle soon developed a highly ambitious con­spiracy; forging twisting death metal rhythms and haunting doom chords in the archaic traditions of the crafts. 1992 spewed forth Pentacle's first official rehearsal tape, "Caressed by Both Sides"; a primal anthology of pounding horror, which contained 4 of their own compositions as well as the band's gloomy interpretation of Hellhammer's "The Reaper". 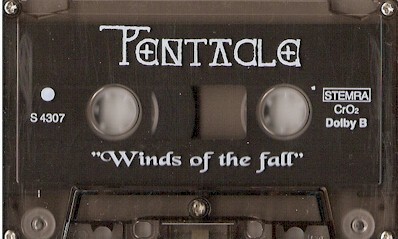 Shortly after the tape's release, Pentacle gained stage expe­rience supporting bands such as Asphyx and Gorefest. 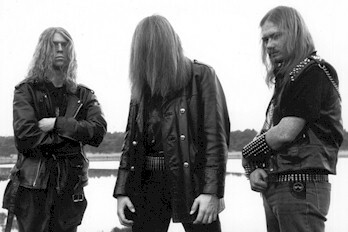 The heretical spawn crawled on into 1993 with the trinity's one and only studio demo, "Winds of the Fall", which unleashed 5 more charnel hymns to conquer souls enslaved by ancient metal. Their earthly testimony of doom was reflected in prai­sing reviews and encouraging respect from kindred bands. More stages were shared with the likes of Occult, Anathema, Senten­ced, Ancient Rites, Acrostichon, Eternal Solstice and Samael...1994 witnessed Pentacle descending into the recording dungeons once more, to evoke "A Dance Beyond"; exclusively destined to be included on the DSFA 6/"Paradise of the Underground" compilation CD, for the Dutch based DSFA label. Pentacle's first vinyl desecration "Exalted Journey", emerged a few mooncycles later; from the Belgian Midian Creations; a 2 track 7" EP to spread the ceremonial onslaught even further. In March/April 1996, Pentacle's ranks of the depraved were joined by axewielder Edwin, to create an even heavier and deadlier storm of slashing metal scythes, as the 12 " Picture Disc/ CD, "The Fifth Moon", proves. No lyrics. Xeroxed covers. Regular Tapes.